In those lazy, crazy, hazy days when I worked in the world of insurance I longed to get a claim which made me laugh out loud. I never did get one but I finally just made up for it by finding out about some of the weirdest claims ever. A naval officer was returning home to the UK in his ship and his wife went to the dock to meet him. She left the car near the water’s edge and went to watch the ship arrive. Did she forget to put on the handbrake and watched as it rolled in slow motion into the water? No. Did a giant seagull attack it? No. Instead, an inexperienced navigator hit the dock as he guided the ship in and sent the car down to Davy Jones’ locker. Some people aren’t happy causing just one claim, are they? The chap in question here bumped into a car in front of him and damaged a rear light on it. Being a sensible sort of dude he reversed a bit to see what damage had been caused. Was there a car behind him? Yes, there was. Did he hit it? Of course he did. In a final flourish our demented genius decided to get out of the car to sort things out. The good news for fans of slapstick comedy is that a cyclist was passing and our Mr Magoo like hero sent him flying with the car door. I realise that the lack of details and dates might make you wonder if those last two stories were even true. However, this one happened in December of 2011 in Seattle so it must be true. 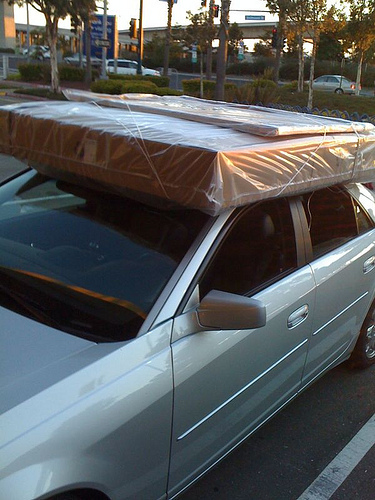 A couple were using their SUV to transport a mattress but they had failed to tie it securely onto the top of the vehicle and the darn thing flew off. It caused a 3 car accident but the good stuff doesn’t end there. The woman flounced off and went to drink a coffee with Frasier and listen to Nirvana or whatever people in Seattle do after a car accident they cause with a mattress. Where did the guy go? He was later found hiding in the back seat of a car in which a driver had stopped next to the accident to help out. The sneaky fellow had hidden in the car to make his getaway. The condition of the mattress is unknown. This entry was posted in Humour, Musings, News and Views by Robert Bell. Bookmark the permalink.